Transport your New Year’s Eve guests to a hot Caribbean style party with a Havana, Cuba event theme. Havana is known as The City of Columns, and that’s just the tip of the palm tree. There are ports, beaches and historic landmarks that a party planner can “build,” such as Morro Castle. Nautical theme supplies can help you evoke the Cuba and the sea that Hemingway loved. Luau event theme products, including tropical banners, are appropriate for a Cuban theme if you choose decorations that accurately represent flora and fauna that can be found on the tropical island, including palms, parrots, orchids and flamingoes. Event backgrounds can instantly transform party room walls into tropical beaches or buildings in Old Havana’s Cathedral Plaza, where a Tropicana-style show is still staged on New Year’s Eve. Speaking of the Tropicana, an Evening at the Tropicana event theme is perfect for a New Year’s gala with its combination of tropical splendor and sophisticated nightclub glamour. The Tropicana has stages indoors and out. To get the feel of the outdoors one, drape a star patterned gossamer overhead and hang patterned flat paper, such as a flagstone pattern along with a tropical foliage pattern, along the walls. Need an impromptu stage or DJ area? Use a pink or blue spotlight background illustration as shown below. Mix palm trees with bright primary or neon colors and actual spotlights with candlelight. Echo the dark green of the palms in other decorations, then accent with yellow, red (or hot pink) and bright blue. Use your palm green in table covers and solid color tableware in a monochromatic way, and then create contrast with centerpiece groupings of tropical fruits or flowers. A vase or candle holder from Glassware Favors, such as our Bursting Bubbles vase, can hold an LED candle or flowers. Wrap it in a “fence” of sugar cane sticks (find them here). It’s OK if the cane sticks are uneven in height, and even better if plenty of the beautiful bubbled glass shows above the cane “fence.” You can glue the cane sticks to the vase but even so, tie it all up with a twisted strip of gossamer streamer to complete the look. It’s where Snow White met her prince. It’s where Edward and Bella fell in love. It makes for the perfect theme for your prom- an enchanted forest. When done with the right decorations, an enchanted forest theme can be romantic and fun when done with elegance and grace. Perfect lighting is key with a theme like Enchanted Forest, and there are multitudes of lighting options available. If candles are allowed, set up Black Forest Candle Stands around your venue. The metal leaves and clear beads are great for accentuating a walkway or illuminating an entrance. The candles give off a nice, softened glow. What’s a forest without trees? These white lighted trees are seven feet high and will add dimension and beauty to your prom. They can serve not only as lighting, but as incredible scenery in the Enchanted Forest. After draping the tables in the gossamer color(s) of your choice, top half of them with the Ivory Decorative Birdcage Centerpiece. It has the look of a real birdcage and can hold either a tealight, votive or LED candle. Dress up the birdcage for your Enchanted Forest theme by adding greenery, flowers or miniature faux birds. With the other half of the tables, top them in gossamer and then add the Black Forest Centerpiece. This metal candle holder is nearly 10 inches high and can be accessorized with moss or twig garland. 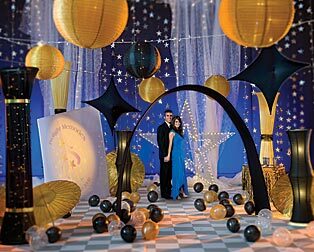 While your Enchanted Forest prom is going to be breathtaking no matter where you look, it’s a good idea to have a focal point where people will want to take pictures. Use four chocolate luminescent square columns as the base for a gazebo. Top it with the gazebo metal topper and decorate with gossamer, ivy, garland and lights. Add color to the gazebo with elegant tissue butterflies, and you’ve got yourself a beautiful meeting place for prom goers who want the perfect backdrop for their pictures. No Enchanted Forest is complete without a touch of magic. These Fairy Berries will add sparkle to the event by flashing on and off, giving off the light of fireflies. They can be hung by the included hook or used in water. Don’t send your guests home empty handed! Since they will be so impressed with the Enchanted Forest theme, they will surely be taking lots of pictures. As a parting gift, give attendees this Enchanted Forest Mod Frame. Have it personalized so they will remember the night for a lifetime! Retro themes, where the event takes memories further back to the 70s, 60s or 50s, are also popular New Year’s themes. Black tie theme events can be old-fashioned or ultra modern, and can easily be combined with a time theme or city event theme to bring fresh anticipation and excitement to a New Year’s party. New Year’s Eve partygoers love to count down the minutes with Big Ben, or cultivate the timeless appeal of the Left Bank and Mr. Eiffel’s masterpiece. Spending New Year’s Eve in Monte Carlo, Chicago or the Big Easy is always in style!